13 for 2013 - May Finishes! For May, I only had a couple of little projects to get done, but I also had a couple of bonus finishes as well. My big project was to finally make a curtain for the top of the stairs. It's a North facing window that doesn't get a *ton* of sun, I just hated constantly walking by it looking so naked, so I know it needed something. Voila! 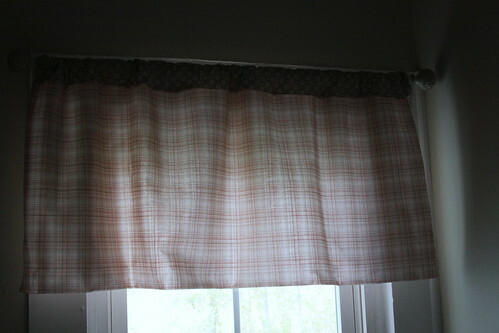 It's nothing special, but it covers up a blank space in my mind, just a nice valance-sized half-covering. May's next project was another Birthday Block. Originally I had two slated for this month, but someone dropped out of the swap, so I only had to do one. This block actually used a template, which was interesting, but I'm happy with the finished result. 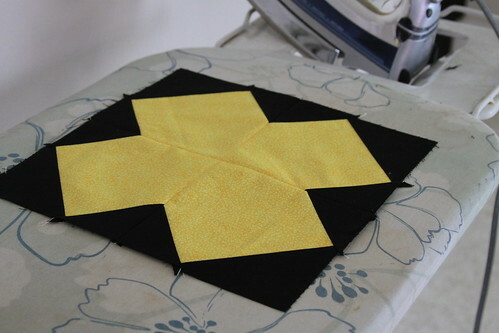 The swapper for this block asked for Hufflepuff colors, so I was happy to do this yellow and black version. Even the back is adorable! 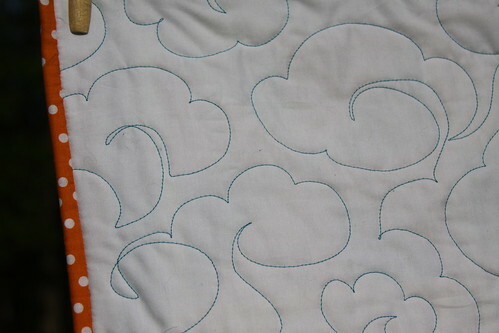 I knew as soon as I finished it, I wanted clouds to be featured in the quilting. 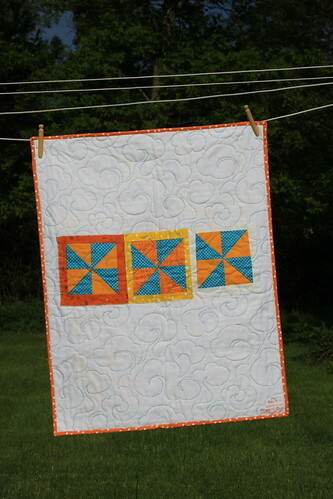 Luckily my quilter had this great pantograph of clouds! So....one baby quilt bonus. Time for another one. I have a special relationship with this quilt. 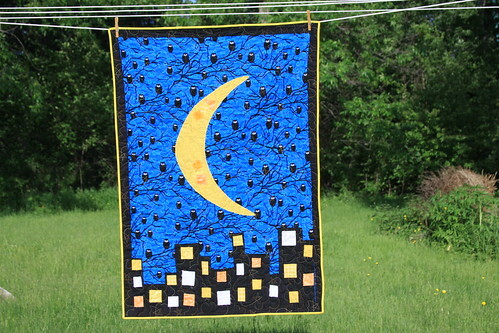 I really consider this piece to be my "return to quilting" piece. 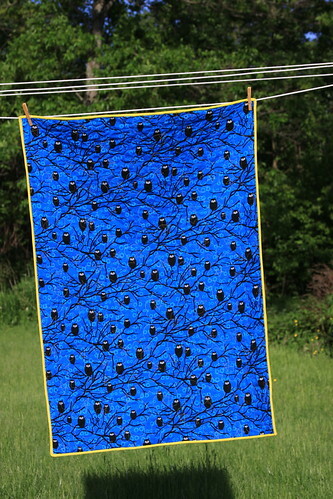 As a lot of quilts, this one started with fabric. 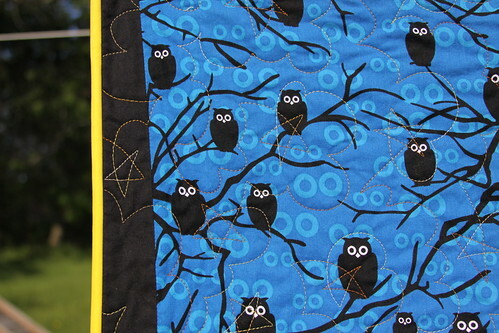 All that gorgeous Michael Miller owl fabric from 2 falls ago. I think I bought 2 whole yards of it. Why? I don't know, I just *had* to have it. I didn't know why I had to have it until I awoke from a dead sleep, grabbed my bedside pad and sketched out the rough idea for this quilt. See? Aren't those owls adorable? 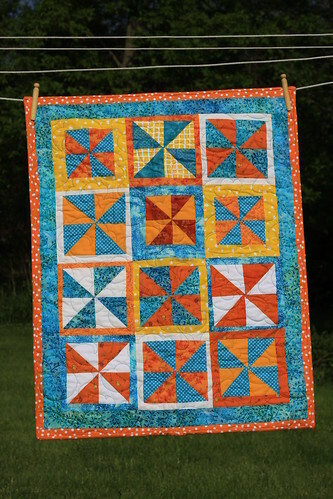 What about that quilting? Clouds and stars, come on? It doesn't get any better than that! Since I loved those owls so much, and bought so much fabric, the back was easy! I love how you can kind of see the ombre of the thread in this one, it's a yellow/orange blend, which ended up working out so perfectly. So, for now, it will be a fall wall-hanging. Until there's a baby to wrap it in, someday. That's all in my productive May! Onto June!